It’s a known fact that cheese can make anything at least 40% better. 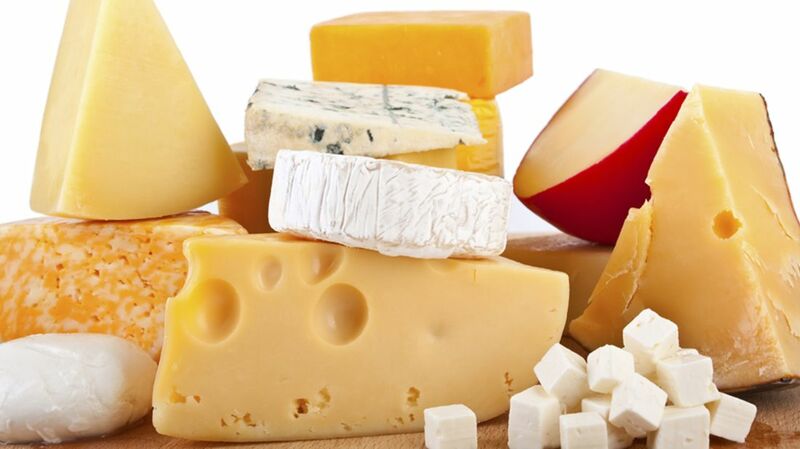 Ever wonder where cheeses got their names, though? Here’s a look at the back stories of a few familiar cheeses. Roquefort has a decidedly romantic origin story. According to French legend, a young shepherd was eating his lunch at the mouth of a cave one day when he spied a gorgeous shepherdess in the distance. He left his bread and cheese to pursue the girl, only to find the forgotten cheese several months later. By that time, the cave’s mold had transformed the cheese into something far tastier. The story may be a bit far-fetched, but it gets the basic facts of Roquefort production right. The name is legally protected so that it only applies to cheeses aged in the caves that burrow into Mount Combalou near the French commune of Roquefort-sur-Soulzon. The commune’s residents have had plenty of time to get the production methods down pat, too; Roman writer Pliny the Elder mentioned a Roquefort-like cheese from the area in a text from AD 79. Roquefort’s not the only cheese that takes its name from an area with lots of caves. Cheddar, which has been around since at least the 12th century, takes its name from the English village of Cheddar. The nearby Cheddar Gorge is full of caves that offer ideal conditions for aging cheese, so dairy farmers and their wives began using their surplus milk to make a new kind of cheese. Unlike a lot of other cheeses with geographically protected names, modern cheddar can come from anywhere, not just the area around Cheddar. Cheddar cheese eventually became one of England’s most popular snacks. In 1170, King Henry II bought over five tons of the cheese for the bargain price of just a little over £10. By the time Charles I took over the throne in 1625, demand for the cheese had grown so high that the only place one could find it was at the king’s court. Monterey Jack only takes half of its name from a place. Franciscan friars around Monterey, CA, crafted a mild white cheese throughout the 19th century, but the semi-hard treat didn’t begin spreading until Scottish immigrant David Jack started marketing his own version of the cheese. Monterey Jack’s frequent partner in deliciousness is also an American invention. In 1885 Wisconsin cheesemaker Joseph F. Steinwand started varying his production process for cheddar by washing the curds with cold water. The washing process cut down on the acidity of the cheese and gave it a milder flavor than regular cheddar. Steinwand named his creation after the nearby town of Colby, WI. When you buy Colby at a deli, it will often bear the name “Longhorn Colby.” What’s the story on the “longhorn” part? The cheese itself is actually no different from any other Colby you’d find. The term “longhorn” refers to the size and shape of the block the cheese comes in; a longhorn is simply a long cylindrical block of cheese. This one’s pretty straightforward. Pecora is the Italian word for sheep, so the family of hard Italian sheep milk cheeses goes by the name pecorino. If you enjoy Havarti, thank Hanne Nielson. Nielson created the cheese at her family’s farm in Øverød, just north of Copenhagen, during the mid-19th century. Nielson had decided that she wanted to create a Danish equivalent to Switzerland’s tasty semihard cheeses after doing some traveling around Europe, and the buttery Havarti was the end result of her experimentation. She named the cheese after the family’s farm, which was known as Havarthigaard. The pizza lover’s best friend takes its name from the diminutive of the word mozza, which in Neapolitan dialect means “cut.” “Mozza” in turn derives from the verb mozzare, which means “to cut off.” The name refers to how the cheese is produced; making mozzarella involves cutting the curds and then shaping them into the familiar balls you see in cheese shops. The processed cheese that so frequently ends up atop our burgers didn’t get its name from Americans. Instead, we can thank the British for this moniker. When British colonists first came to North America, they brought their knowledge of cheddar production with them and began cranking out cheeses in impressive volumes. These early colonial cheddars weren’t the world’s tastiest cheeses, but they were pretty cheap to make. In fact, the production costs were low enough that colonists could ship them back across the pond and sell them at discount prices back home. British shoppers didn’t love the quality of this “Yankee cheddar” or “American cheese,” but since it was easy on the pocketbook it sold fairly briskly. What we think of as “American cheese” didn’t come along until 1916, when James L. Kraft patented a pasteurization process that stabilized cheese to allow for easy transport over long distances. The name “American cheese” gradually migrated to Kraft’s processed cheeses, and now the mere mention of the phrase causes cheese aficionados’ noses to wrinkle.